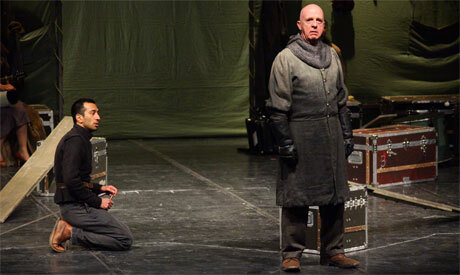 Ahram Online talks to Keith Bartlett, the British actor who played Claudius in the Globe theatre’s performance of Hamlet at the Bibliotheca Alexadrina on 12 January. Bartlett also plays Polonius on chosen days of Hamlet’s staging across the world. Bartlett has a long CV that includes several Shakespearean roles. He has spent many years working with Cheek by Jowl company and the Royal Shakespeare Company. Globe’s visit to Alexandria came as part of the theatre troupe’s two-year world tour, Globe to Globe, which will see them perform in over 200 countries. Egypt was the 67th country to host the Globe’s touring play. Ahram Online (AO): Are you working with Globe frequently? Keith Bartlett (KB): At the moment I’m just commissioned for this tour but I have also worked for the Globe previously in their staging of A New World: A Life of Thomas Paine, a biographical play by the English playwright Trevor Griffiths. In terms of Shakespeare, I worked with a company called Cheek by Jowl for three years, as well as with the Royal Shakespeare Company for six years. I’ve done quite a lot of Shakespeare. AO: In Hamlet most actors swap roles, except for Hamlet, and every day actors play different roles. You are a total of 12 actors and it’s a puzzle that changes for each performance. You play two roles, Claudius and Polonius. How did you rehearse for all those different roles each time played by different actors? KB: Some members of the cast play even three or four roles. We rehearsed in a carrousel style. Director Dominic Dromgoole would work on one scene and then he would say: ‘Ok, now we swap parts.’ As we were asked to play different roles, we were also asked to watch how our colleagues play, observe their version of another character that would become ours during the next rehearsal. It’s quite often that in the theatre, the actors do not like to ‘steal’ ideas from other actors. Yet, Dominic actually encouraged us to steal from each other. So when we were rehearsing we would look at the colleague and think ‘oh, that’s a good idea, I’ll try to use it when I play the same role.’ As such it was becoming an interesting melting pot of ideas. AO: How do you manage to keep the energies of both roles separated? KB: I play Polonius and Claudius on different days. They have two completely different energies and I don’t find that there is any cross fertilisation. On the contrary, the contrast between them is fascinating. Also change is as good as a rest. If you’re doing one part relentlessly on the long run, you can get stale but with the way that we’re doing it – with three Poloniuses, three Claudiuses, three Gertrudes etc – each night you work with a different person and there are different mixtures. This procedure provides tremendous energy and freshness. And as we travel, we discover new forms and meanings and the whole play becomes better and better, I believe. AO: Constant travelling is not an easy feat. For younger people it might sound easier yet for the older generation with established families, seven to eight weeks on the road and then go home for two weeks only to continue the tour again, is a challenge. How do you manage all that? KB: One of the greatest elements of modern technology is that it helps us stay in touch much better than it used to be before. I am in daily touch with my wife, who is also an actress. We talk virtually every day. We do not have small children which makes the whole travel idea easier. We already have one granddaughter. For younger families this might be more difficult of course. AO: As a theatre team, you are very supportive to each other. KB: Indeed, we look after each other. On the creative level we make suggestions to our colleagues. In parallel we are in a close touch with our base in London. And we travel across the world, where we also meet a variety of audiences. In Egypt we were received by a tremendous audience and at a very exciting venue. We had a wonderful time.